Travel to Espiritu Santo, Vanuato with tour leaders Jess and Tom to get wrecked diving the iconic SS President Coolidge shipwreck in April 2018. Considered by many divers to be the best wreck dive in the world, the SS President Coolidge was a luxury passenger liner converted to a troop carrier during WWII. 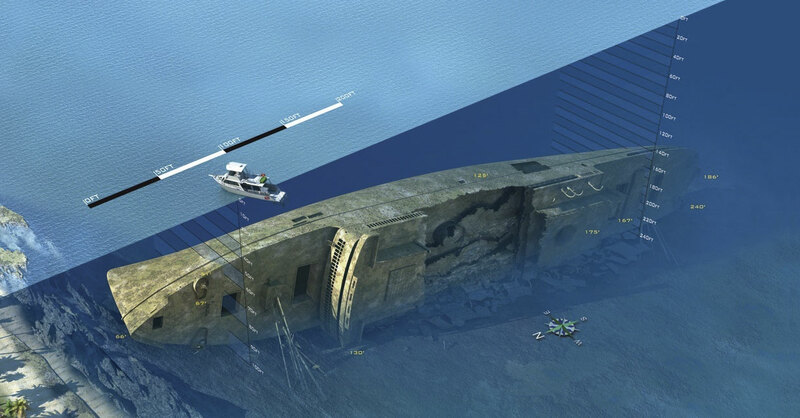 While entering Santo harbor she was hit by friendly mines and sunk, providing divers with a remarkable underwater playground. Almost completely intact, you can swim through the numerous holds and decks viewing the reminders of her glorious days as a cruise liner and the remnants of her days as a troop ship. 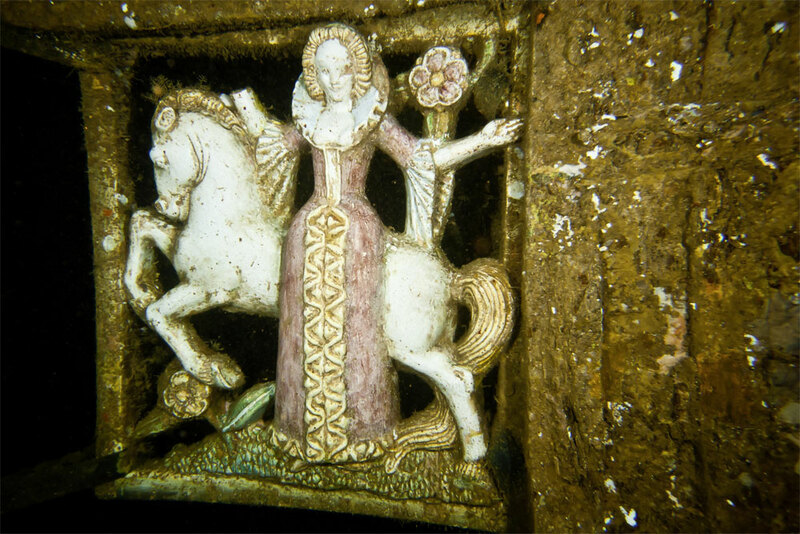 There are guns, cannons, jeeps, helmets, trucks and personal supplies left by some of the soldiers, as well as the beautiful porcelain statue of 'The Lady', chandeliers and a mosaic tile fountain. The wreck is covered in coral and is the home to a plethora of sea life such including barracuda, lion fish, and a host of reef fish. 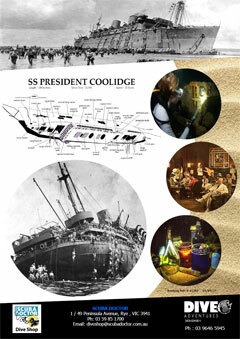 The SS President Coolidge is the world's largest accessible wreck. She is 200 metres in length and rests in 20 to 72 metres of water! The 10 shore dives on this trip will enable you to fully appreciate her magnitude and majesty. Departing 17th April 2018 (ex Brisbane, NF021) and arriving back on 23rd April 2018 (ex Brisbane, NF020), this fantastic trip includes return airfare from Brisbane, 6 nights accommodation at The Espiritu Hotel, Santo and 10 shore dives with Pacific Dive. Group Airfares — Please be aware that this package has been based on the use of a group airfare that allows a minimum of 8 passengers to travel. Package subject to change at any time without notice due to supplier rate changes and USD exchange rates. See the other terms and conditions here. To secure your place on this dive holiday, please complete the Dive Adventures Online Booking Form and pay a non-refundable deposit of $550 per person. For more information about this dive vacation, please Contact Us. The Lady and the President: The Life and Loss of the S.S. President Coolidge, by Peter Stone. ALL divers who dive with us on the SS President Coolidge at Santo, Vanuatu should have DAN dive injury Master or Preferred plan insurance. Please note: DAN dive insurance is conditional on you having appropriate certification for the dive, and that you are using appropriate breathing gas mixes and equipment during the dive, or repetitive dive series. We also recommend you have appropriate medical evacuation insurance. We also insist that you MUST have appropriate Travel Insurance, such as that provided by Aussietravelcover (see details below). Vanuatu is a 'Y' shaped chain of 83 Islands lying 2500 kms north east of Sydney. The islands vary from towering volcanic cones to others covered in dense rain forest. Some are raised coral islands with wide beaches and deep natural harbours. The international country code for Vanuatu is 678. Vanuatu is 11 hours ahead of Greenwich Mean Time (GMT). Espiritu Santo is the largest island in the nation of Vanuatu, with a population of around 40,000. Climate: The climate in Vanuatu is varied. Winter is the drier season with temperatures averaging around 23°C between April to October. In the wetter Summer season, temperatures average 28°C from November to March. Currency: The currency of Vanuatu is the Vatu. Visa and MasterCard are accepted at most hotels. American Express is not accepted in Vanuatu. Dress: The emphasis is on light and casual clothing but not too brief in public places. Swim wear is not permitted in public areas. Remember to cover up at dusk and dawn to prevent mosquito bites. Sun protection is absolutely essential. 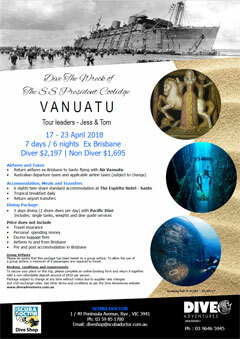 Entry Requirements: Visitors who are nationals of Commonwealth countries, EU Countries, Fiji, Japan, Norway, Philippines, South Korea, Switzerland and U.S.A. do not need visas to visit Vanuatu. Water: The urban water is supposedly safe to drink from the tap, but we recommend drinking bottled water. In the tropics it is important to drink plenty of non-alcoholic fluids to avoid dehydration. Language: Bislama, English and French are widely spoken throughout Santo. There are 115 ’Mother Tongues’ that are commonly spoken throughout Vanuatu. Power: 220-280 Volts AC, Plug I power outlets (same as Australia). Tipping: There is no tipping or bargaining. It goes against local tradition. Diving: Espiritu Santo offers the amazing President Coolidge, the largest recreational diving wreck in the world. Average water temperature is 26°C. A 3 mm wetsuit is recommended. Dive operators supply tanks, weight belts and dive guide services. There will be an extra charge if equipment hire is required. See also Wikipedia: Espiritu Santo. Please bring your certification card(s) and maybe your log book. Pacific Dive has full equipment rental which you can arrange for in advance. Diving fees include tanks, weight belt and weights. Most divers are more comfortable with their own dive gear so bring what you think you want to use. All dives on the SS President Coolidge are decompression dives and to ensure our customers and guides are able to dive safely on this deep wreck dives are planned according to DCIEM Decompression Theory Tables. When diving the SS President Coolidge divers use 11.4L Aluminium Cylinders and guides carry 5.7L Drop Tanks. 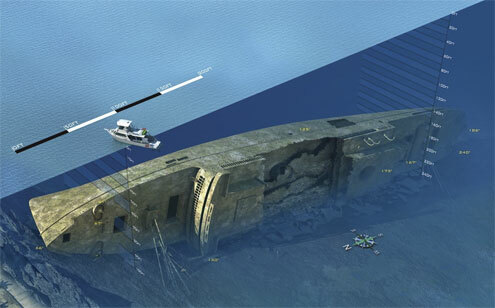 Extra tanks are positioned at depth to ensure there is always have sufficient gas for the dives. Suggested Diving Essentials: Gear bag, BCD, torch with batteries and charger, mask, snorkel, fins, regulator and ocy, dive watch/computer, multi-level dive computer, spare parts kit, camera, flash, film. A 3 mm wetsuit is recommended. Cylinders with DIN valve fittings are available, but bring your DIN-Yoke adaptor(s) just in case. Nitrox — Nitrox in 5.7L, 7.9L or 11.4L tanks. Blends can be anywhere from 30% to 100%. We would recommend bringing your own stage regulators. Oxygen costs 10vt per litre. Trimix — You need to book in advance to have Helium available as Pacific Dive have a limited supply. 25VT per litre. Rebreathers — 3L or 2.7L tanks for rebreather customers. 1,500vt per dive for DIL and O2 tanks. 797 Grade A Sofnolime available. Side Mount — Tanks with left and right hand side valves are available for side mount divers. Please bring your own rigging. 1,000vt per dive. Twins — Manifold (11.4L x 2) come banded ready to go at 1,500vt per dive. Stage/Bailout Cylinders — 11.4L or 5.7L cylinders filled with air to 200 bar are available. Cost included in the diving. Please bring all bands and rigging. If you have any special requirements, such as the optional extras above, please contact us so that we can contact Pacific Dive and arrange them for you. Sometimes the only way to stay sane is to go scuba diving.